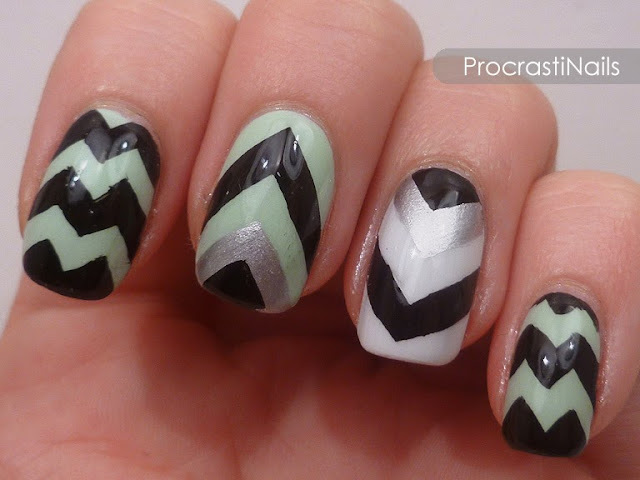 Pinterest Inspired Nail Art Challenge Week 3: Free-hand Chevrons! When I started this mani I was planning to use my chevron craft scissors, but they fought me every step of the way no matter what tricks I tried (painters tape, scotch tape, tape on wax paper, sharpening the scissors, etc.). Thankfully all the other design scissors I got all work just fine, so you'll be seeing some looks with those in the future! Anyway, since the tape wasn't working all of the chevrons you see in this mani were freehanded with a mid-length striping brush and a lot of patience! I won't tell you how long this mani took, but I love how it turned out. Once the base colours dried fully, I went in with my striping brush and painted the rows of black chevrons with Sinful Colors Black on Black on the majority of my fingers. My middle finger was actually supposed to be the same design, but I messed it up and once I re-did the base coat I decided I wanted to do something different on it. 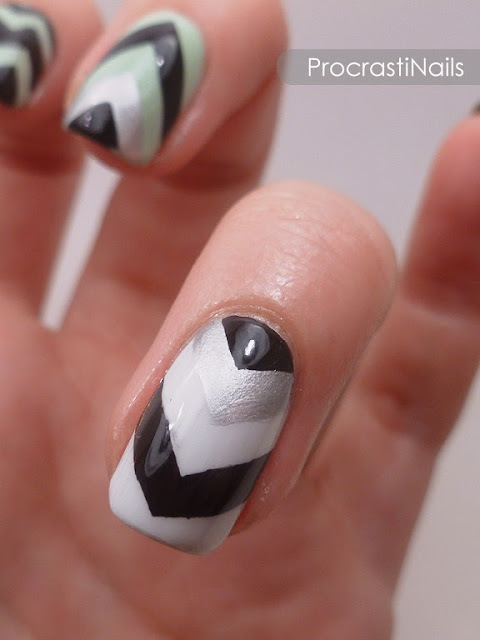 For the accent nail(s) I did the thick black strip first, and then added silver triangles with Acrylic Paint. 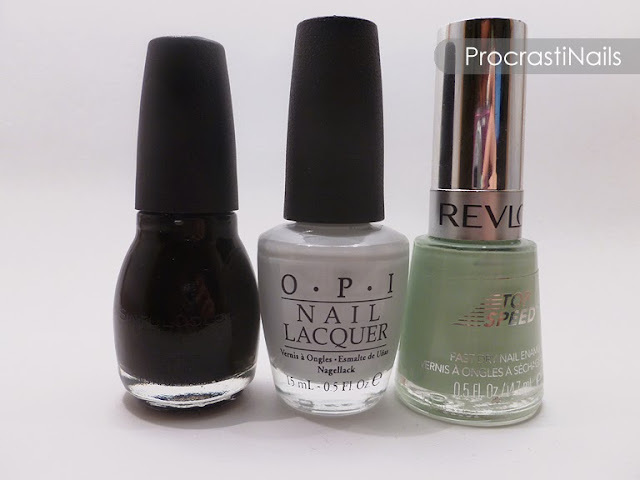 I would have used silver polish, but none of my silvers are opaque enough. :/ When that dried I made a smaller triangle inside the silver with Black on Black. I decided to invert the design on each accent nail to add a bit more visual interest. And that's the look! I'm pretty happy with it, and I'm thinking of doing my first tutorial focusing on free-handing chevrons (since it was much easier once I had a system of how to draw them). Thoughts? Looks great! 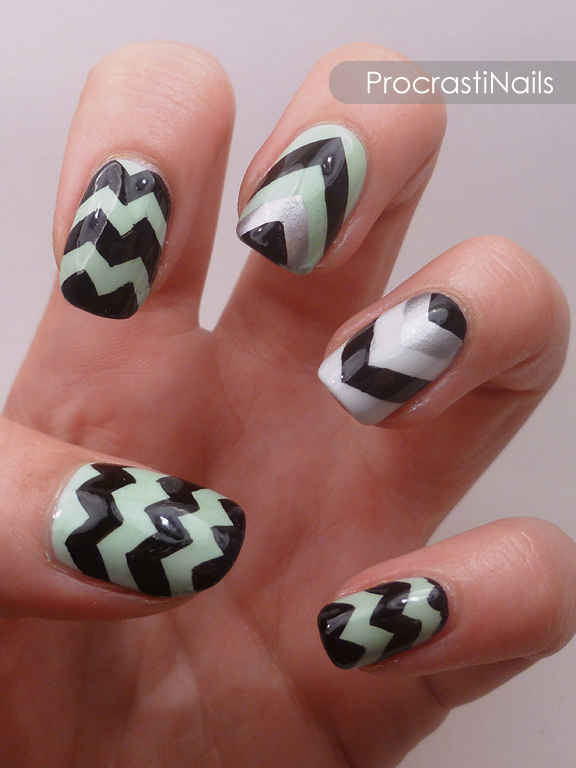 :D I need to try chevrons but I'm scared of doing them free handed, lol. Haha, thank you so much! Yeah, I had to take a break between each finger to steady my hand again. Worth it though! Thanks!! :D I'm thinking about it, I've never done a full picture tutorial before... I think it's something I'm going to play around with! Either way, you should totally give it a try. It wasn't as difficult as I thought it would be! Thank you! Agreed, I'm really happy with it. Wow, I'm impressed! I admire your even spacing, it just looks amazing. Your color selection was perfect, too! 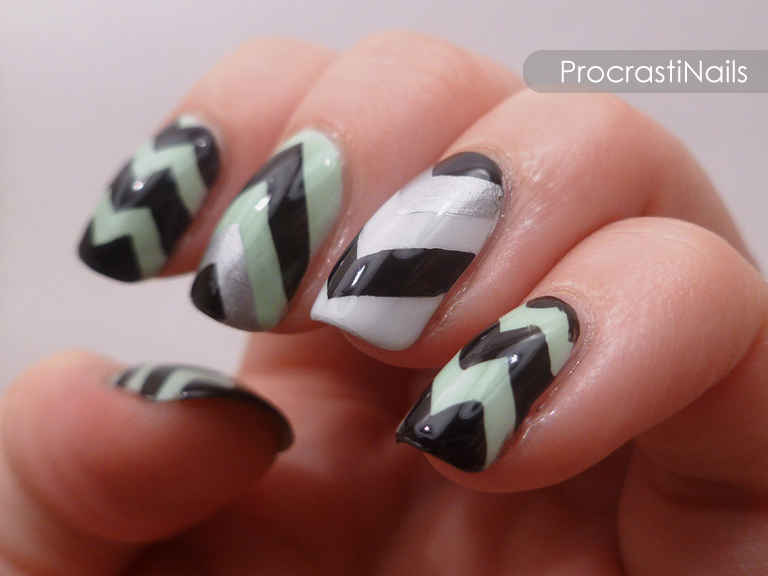 My gosh, this looks great; I can hardly believe you free-handed them - good job! I upvote the idea of a tutorial - I love seeing them. Ah! I wish mine looked this good when I did them!! I have such shaky hands. 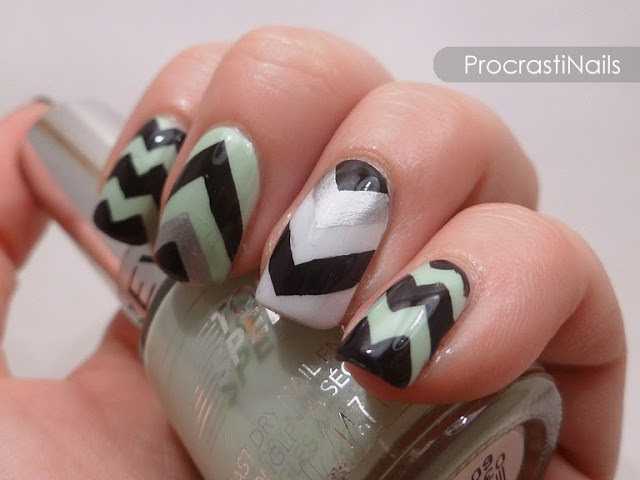 :( Love chevron nails though. Thanks Karla! :) And thanks for hosting the party, can't wait for the next one! 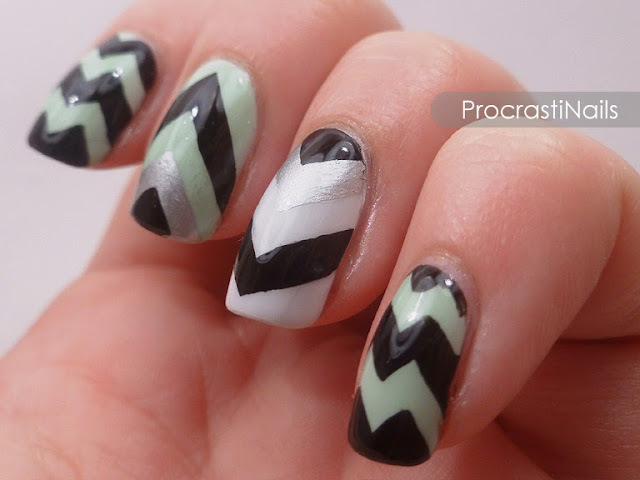 I love chevron nails but have never dared to try freehanding them for fear of messing up. You did them so well!! Also just saw your GoT nail art series - :D I'm a fan!